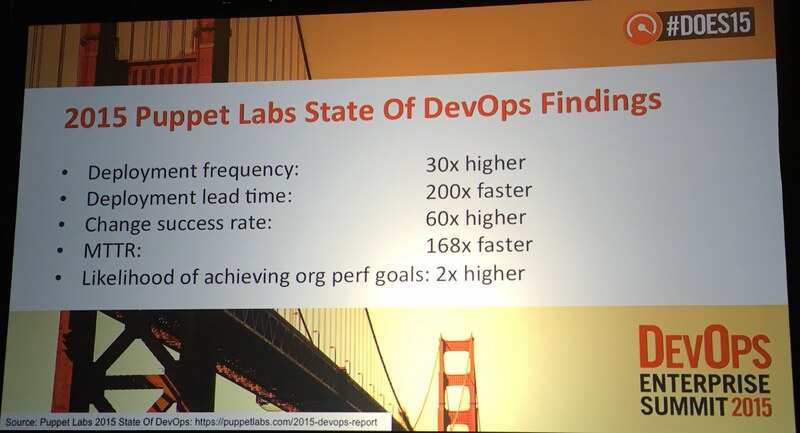 In the opening remarks, Gene Kim shared the stats shown above in the 2015 Puppet Labs State of Devops Findings. It looks like things have improved dramatically for those implementing a DevOps mindset. But, I found it interesting that, as a community, we have improved activities like deployment frequency and lead time, change success rate, and MTTR at ranges of 30x to 200x, but the likelihood of achieving organizational performance goals only doubled. Going forward do we need to continue to focus on these same metrics or have we reached a point where we need to start measuring things that will help us with our next big issues? We need to make sure we are always focused on the things that help us move the needle that really matters. After a point, cramming more deployments in per hour won’t help us achieve our goals. Do we know what is keeping us from making the measure for likelihood of achieving organizational performance goals a 2x, 4x or 8x? 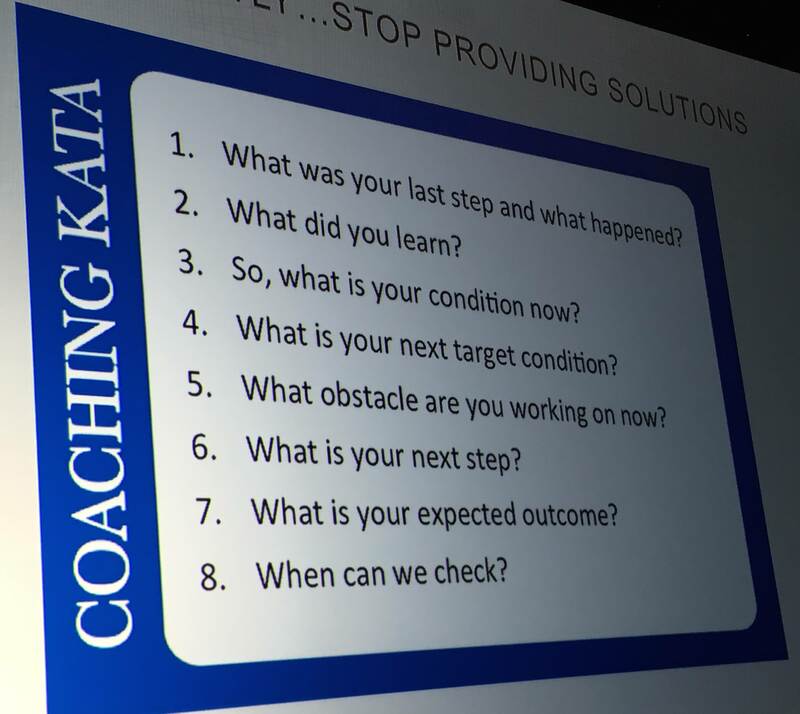 Largely, the stories being shared as successes had a common theme: understanding the value of being a learning organization… growth mindsets over fixed mindsets. Companies, like Nordstrom, that are moving away from telling people solutions to helping them see how to solve their own problems are winning. Many of the metrics talks, including the one Troy Magennis and I gave, had a packed room with more than a few people sitting on the floor and standing by the doors. We talked about how to use (or not to use) metrics to help teams achieve their goals. Specifically, Troy spoke about different types of business analytics to give people a baseline set of info. I encouraged people to avoid some costly anti-patterns like using vanity metrics, measuring individuals and creating wobbly businesses by having unbalanced metrics. Troy wrapped it up by helping people understand its ok to make trade-offs with your set of metrics and to monitor trends instead of getting hung up on too many individual data points (without succumbing to any flaws of averages of course). Our final point was to make your visualizations visually enticing to encourage smart people to go deeper and look for root causes. After that talk, I noticed that other talks on metrics, like the one from Mark Michaelis, had similar advice and also took the stance of “we can’t tell you what to measure, you have to decide that in your own context” but we’ll help you avoid these pitfalls. People really heard the message and had lots of questions about identifying and weeding out the vanity metrics in their organizations. They were also asking for advice on how to convince their executives and leadership that certain metrics really weren’t as valuable as they thought. Appropriate wielding of metrics is going to be a hot topic for the forseeable future. Courtney Kissler and Jason Josephy from Nordstrom on Mindsets, metrics and mainframes… oh my! Dominica DeGrandis explained how each dependency cuts our probability of finishing on time in half. So, a huge question that resulted from discussions around this topic was “How do you visualize and manage your dependencies?” Basically, now that we know this, what do we do about it? This is one of the things we need to focus on in the future as it is so crucial to our business success. One company using SAFe’s way of visualizing dependencies. Would I recommend this conference? I watched the attendees at this conference become more energized by each passing day. They felt community by finding others with their same issues and needs. They heard stories of people that were farther on their journey and were able to pick up tips to help themselves. They heard stories of people who were just starting and whom they could help. But, by far and away, I saw in people’s eyes the same excitement or awe that I experienced when I went to LSSC12 in Boston. It was then I knew that for many people this was their seminal conference and would set the tone for return visits year over year. If you are interested in the DevOps mindset, definitely check out DevOps Enterprise Summit 2016!